Horn-heavy rock'n'rollers Rocket from the Crypt officially disbanded back in 2005, but it looks as if the San Diego crew have something up their sleeves for 2013. 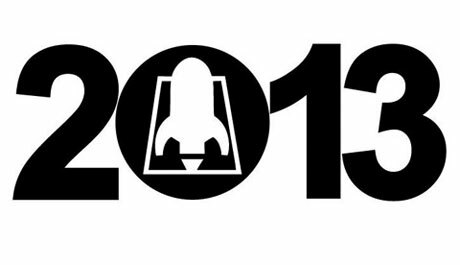 While details are supremely scant at present, the band posted an image on their Facebook page this afternoon (November 2) that brandishes their familiar rocket silhouette logo and the message "2013." Fans are already blowing up the comments section, pondering whether this means the band are prepping some reunion dates or possibly and LP, but the group have yet to lay out their plans for the coming year. Considering guitarist/vocalist John Reis dusted off Hot Snakes in 2011, a reunion tour can't be ruled out. Also, despite not playing live since their farewell Halloween gig in 2005, Rocket from the Crypt did manage to get back together for a recent performance on kids show Yo Gabba Gabba! If you're one of the proud people sporting a RFTC tattoo, you just might get another chance to get into a show or two pro bono. No doubt some are sharing one Facebook fan's quip: "I hope this isn't a cruel cruel joke." Despite issuing Yo Gabba Gabba! track "He's a Chef" on a 7-inch earlier this year, Rocket from the Crypt haven't dropped a studio album since 2002's Live from Camp X-Ray. METZ & Swami John Reis "Caught Up"